The purpose of the “Ring of Honor” is to recognize some of the former greats of Central Basketball who have established a solid foundation for our basketball program to build on. Photo by Jack Slayton. 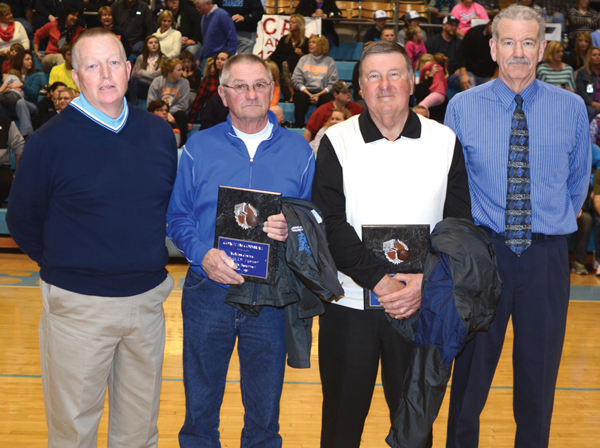 Pictured, from left, are Central Athletic Director Doug Armstrong, Coach Jim Cornwall, Coach Mike Hodge, and Chargerette Basketball Coach Johnny Morgan. Coach Jim Cornwall, a former University of Tennessee basketball player, became the head coach of the Charger Basketball Team in 1968, following another Tennessee player, Coach A.W. Davis. Coach Cornwall was the head coach for 19 years until 1987. As head coach, his teams won 324 games, including 2 District Championships, 2 Region Championships, 4 sub states, and 1 trip to the State Tournament where they advanced to the Final Four. Coach Mike Hodge started his career as the boy’s assistant coach under Coach A.W. Davis and then under Coach Jim Cornwall. Coach Hodge also served as the 1st full time head baseball coach at Central for 6 years. From 1974 to 1978, he was the head coach of the Chargerette Basketball Team. Then he was the head coach of the Charger Basketball Team from 1988-1996. Coach Hodge’s teams won 2 District Championships and 1 Region Championship. They went to the State Tournament in 1983 and advanced to the Final Four. After his retirement in 1996, Coach Hodge served as an assistant women’s coach at Clemson University.